The Our Miss Brooks TV show, like many other comedy series of the day, began on the radio in 1948. Both the radio and TV versions aired on CBS. It was a comedy about a wise-cracking, spinster English teacher at Madison High School who yearns for love with Philip Boynton, a Biology teacher. She also had lots of trouble with the Principal. She was generally depressed about her lot in life and yet she joked about it in ways that kept the audience laughing throughout each episode. In the fourth season, the high school got torn down to make way for a highway project. Miss Brooks started teaching at a nearby private school and most of the cast from the first three seasons continue to appear. One new cast member (Gene Barry) adds a new element as Miss Brooks new love interest. The difference is ... this time the guy isn't shy and pursues her! The antics of Connie Brooks began on the Our Miss Brooks radio show with its first audition show on April 9, 1948. That program ran for approximately 375 episodes over 10 years! In fact, it aired alongside the TV series for its entire run and the radio show even continued for another year thereafter! There was also an Our Miss Brooks stage play in 1950 and a movie in 1955. 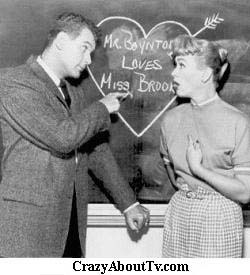 In the 1955 movie, Miss Brooks finally got her proposal from Mr. Boynton and married him! Miss Brooks had a cat named, "Minerva". Eve Arden's real name was Eunice Quedens. Deciding that she needed a stage name, she chose it while shopping for cosmetics and spotting the names "Evening in Paris" and "Elizabeth Arden". She was so accepted in her role as Connie Brooks that she was often asked to speak at PTA and other educational meetings. Dozens of High Schools even tried to hire her as a teacher! After this series ended, she starred in another very briefly called, "The Eve Arden Show (1957)". After that, other than guest spots, we didn't see much of Eve until 1967 when she appeared on the series, "The Mothers-In-Law" starring Kay Ballard for 2 years. She made a couple of TV movies after that and appeared in her unforgettable role as Principal McGee in the 1978 movie, "Grease". Eve passed away November 12, 1990 from a heart attack at 82 years of age. Connie Brooks rented a room from an old lady (Margaret Davis) and rode to school each day with Walter Denton. Gale Gordon got his break as "Mayor Latrivia" on the radio in the "Fibber McGee & Molly Show (1935)" which was on the air for 24 years till 1959! He also appeared on several Lucille Ball programs including the My Favorite Husband radio show. He played a bank president on both that program and also later on "The Lucille Ball Show (1962)". He passed away June 30, 1995 from lung cancer at age 89. Richard Crenna's crackly teenaged voice on Our Miss Brooks was good acting. In real life, his voice, even when young himself, was actually deep and adult-sounding. Prior to playing Walter Denton on "Our Miss Brooks", he had a similar role on the radio program, "A Date With Judy (1946). When "Our Miss Brooks was canceled, he got the role of Luke on the series, "The Real McCoys". He appeared in more than 70 movies. As a tribute to his days on "Our Miss Brooks", he appeared in the movie, "Hot Shots: Part Deux" as "Colonel Denton Waltors". Richard passed away from pancreatic cancer on January 17, 2003 at the age of 76. Robert Rockwell was so identified as the "apple of Miss Brooks' eye" that he had difficulty finding other major roles. He did manage to appear on more than 350 television programs spanning a fifty year career, however. Joseph Kearns was probably best known for his role as "Mr. Wilson" on the series, "Dennis the Menace". He started as a theatrical organist, playing music to accompany silent films. He then moved on to play the organ for radio program's background music. He loved the organ so much that he built a home around one. He is also remembered as "The Man in Black", the narrator on the radio program, "Suspense (1942)". Thank you for visiting our Our Miss Brooks page!